What if You decide suddenly to catch fish as bait while is not taken. In this article You will read how to make a fishing rod with assistant materials. You first need to make the rod. It is better suited to such wood: birch, hazel, bird cherry, but you can take the maple or willow. The length of the cut rods should be not less than three meters. Before assembling the rod the rod needs two-thirds sanded with a sharp object: a piece of glass or knife. The line size from 0.15 to 0.3 should be tied to the rod, starting from the middle of the rod, securing the rod end (wrapped around the top). This operation can be performed using band-aid, tape or simply tying the knot. Fishing line should be longer than the rod, approximately 30 cm. After fixing the fishing line prepare and fasten the float. It is necessary to take an ordinary stick, tube or a piece of bark and tie a regular loop to the middle of the line. Below the float it is necessary to tie the sinker, which can serve as a small nail, notched pebble, a nut. The goods should be fixed at a minimum distance of 5 cm from the float. If You did not have the hook, you can make pins, thin steel wire, or go in search of any fisherman that will lend You a hook. If you still fisherman found and made a hook for yourself, remember – it must first sharpen (any stone), and second, when you fish, do not let the slack because the fish will break (the hook will fall out of the lips). The hook attaches (binds) to a scaffold knot and your fishing rod ready. If you make fishing rod does not work, then you can make a ground rod, which is perfect for fishing. Take a long thick fishing line, a hook on the end of the sinker. You take apart the slim leash to tie him to the hook and pin at a distance of 10-15 cm prior to shipment. Now remained only bait the hook and throw the Donk or away from the shore into the lake. The end of a fishing pole mounted on the shore with a branch, peg or standing next to the tree, wear on the line a small load to see the bite. In this article we told You that you can make the bait with their hands from improvised materials easily, especially when there is a great desire to catch a fish. Fans of Minecraft there are a large number of gaming opportunities, for example, to care for the health of the character, in particular, to satisfy his hunger. In the game there are different food products, one of these is fish. Consider ways on how to make a fishing rod and catch fish in Minecraft. 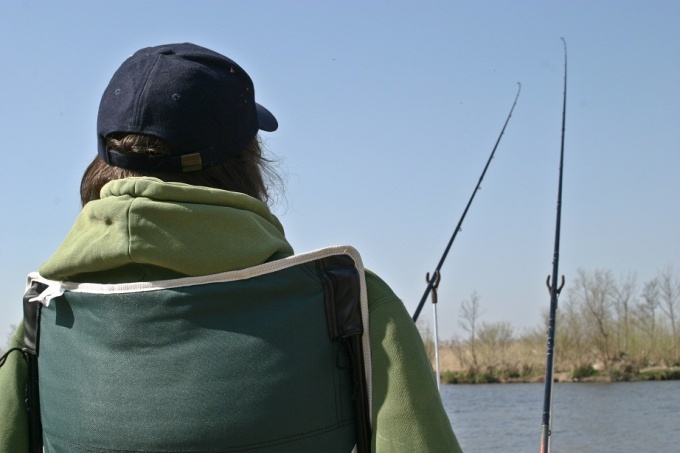 In order to catch the fish, you'll need a set of tools and the following tips. First you need a fishing rod, to produce which of two strands and three sticks. Remember: the more you pull the fish, the longer it will last you a fishing rod. For every elongated fish you lose 1 point of strength. If you don't catch anything, then 2 units. For what caught mob, or a dragon, 3 units. To fishing was much more interesting, you can create the boat. You need five planks of wood, fill the bottom line and place on the middle line of the remaining Board. When fishing be careful: the collision with other objects boat may fall apart. In Minecraft the fishing in any body of water, but it is best to select those water bodies where depth of four blocks. These are the most water bodies safe for fishing rods. The process of catching the fish consists of the following steps: select tools from your bait, click the right mouse button, so you can cast a rod in the selected direction. Then follow the float if it is submerged, it will mean that the fish you hook. Press the right mouse button - the result will be. Remember that in Minecraft fried fish has a much greater strength and restore life. To fry fish you will need a fuel stove. As fuel can be used coal or wood. The fuel is place in the bottom of the stove, and the raw fish is at the top. After 10 minutes your fish is ready. 1. The only material which is not able to destroy a boat, is sand. 2. 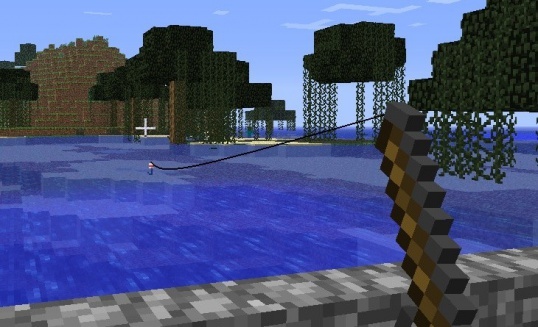 The bait can be used not only for fishing but also for the jokes, for example, to draw me to his friend, and also a fishing rod you can hook onto someone else's boat or mobs. 3. Fishing is best in the rain, that's when the fish bite more often. Thus, the process of fishing in Minecraft is quite simple and very interesting.